The heart is the organ responsible for pumping blood to and from all tissues of the body. The heart is divided into right and left sides. The right side of the heart pumps oxygen-deficient blood returning from the body through the lungs where it is re-oxygenated, and the carbon dioxide waste that the body produces is removed. After the blood passes through the lungs, it enters the left side of the heart where it is pumped out to the body though the aorta and other arteries. The picture below illustrates the pathway that blood takes as it moves through the heart. The structures shown in red contain blood that is rich in oxygen, and the structures shown in blue contain blood that has very little oxygen and high levels of carbon dioxide. 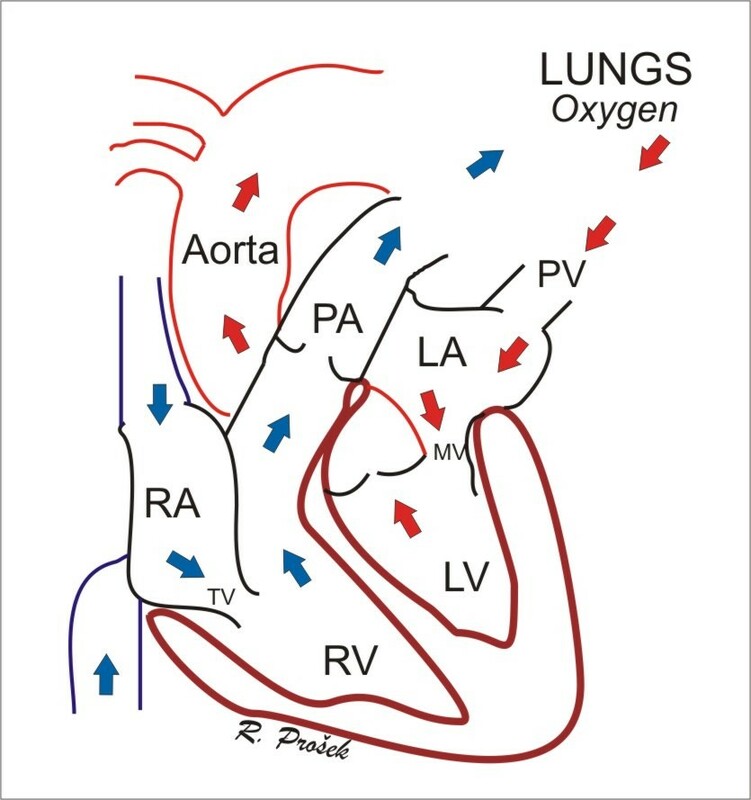 Blue arrows represent deoxygenated blood flowing through the right side of the heart to the lungs, and red arrows represent oxygenated blood leaving the lungs through the left side of the heart. RA = right atrium, RV = right ventricle, TV = tricuspid valve, PA = pulmonary artery, PV = pulmonary vein, LA = left atrium, MV = mitral valve, LV = left ventricle. Each side of the heart has two chambers: an upper atrium and a lower ventricle. 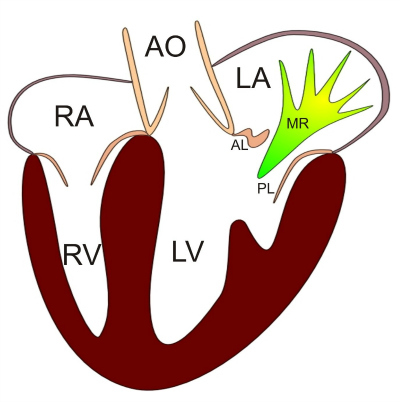 Between the atrium and ventricle on each side lies a valve – the tricuspid on the right and the mitral on the left – that regulates blood flow from the upper atrial chambers into the lower ventricular chambers. As the heart pumps (squeezes), these valves act as one-way gates allowing blood to flow from the atrium above to the ventricle below and preventing blood from flowing backwards into the atrium when the ventricle pumps. From the ventricles, blood is pumped out into the lungs through the pulmonary artery (on the right) or out to the body through the aorta (on the left) through a second series of one-way valves (the pulmonic valve on the right and the aortic valve on the left). The number of heart beats per minute (heart rate) and the different types of heartbeats are controlled by the electrical system in the heart. Normal heartbeats start in the right atrium, but in sick hearts, the heartbeats can start from any chamber. What is chronic degenerative valve disease? Chronic degenerative valve disease (CVD) has many other names, such as endocardiosis, valvular regurgitation, valvular insufficiency, chronic valve disease, or myxomatous degeneration of the valve. This disease is a consequence of degeneration of the valves between the atrium and ventricle on both the right (tricuspid valve) and left (mitral valve) side of the heart, but the valve on the left side (mitral valve) is typically most severely affected. The degeneration process causes the valves to become abnormally thick and develop a nodular “lumpy” appearance. This process is NOT caused by an infection. The degenerative changes in the valves and the structures that support the valves stops them from forming a tight seal between the atrium and ventricle when the heart is squeezing or pumping. This causes the valves to leak blood backwards into the upper chambers (atria). The backwards leaking of the blood through the abnormal valve is called “regurgitation” and causes an abnormal sound called a heart murmur that is typically heard with a stethoscope by your veterinarian. Who develops chronic degenerative valve disease? Chronic degenerative valve disease represents approximately 75% of all heart disease in dogs. Approximately 60% of affected dogs have degeneration of the mitral valve, 30% have degeneration of both the tricuspid and mitral valves, and the remaining 10% have degeneration in the tricuspid valve only. The risk of developing CVD increases as dogs get older and is rare before the age of 4 years. In addition, small breed dogs (dogs weighing less than 40 lbs. (18.2 kg)) are more likely to get CVD than larger dogs. Certain breeds also have a higher risk of developing CVD. CVD is a degenerative process associated with aging. It is not caused by an infection. Many older dogs with dental disease also have CVD but the dental disease is not the cause of the CVD (though good dental hygiene is an important part of ensuring that your dog lives a long and healthy life). In addition, there is likely an inherited genetic component in some breeds, such as the Cavalier King Charles spaniel, but the specific genetic evidence for the majority of cases of CVD is lacking. What happens to my dog when it gets CVD? The leak (regurgitation) caused by the degeneration of the valves eventually leads to enlargement of the heart chambers (the atria and ventricles). The majority of dogs with CVD feel and act normally and the only evidence that they have CVD is the sound of the leak (heart murmur) that is heard by your veterinarian when using a stethoscope. This is typically called the preclinical stage of the disease (or Stage B1 and B2); that is, your dog is considered asymptomatic. Most dogs with asymptomatic CVD never get sick from CVD, but about 1/3 will eventually develop clinical signs or clues that you will notice (see list below). This usually happens slowly over a period of years, but can sometimes happen quickly. In general, the bigger the leak, the bigger the heart gets and eventually when the heart is big enough, your dog can start to have problems that you will notice, such as fast and/or labored breathing, coughing and other clinical signs (see the list below). The clinical signs occur when the pressure in the enlarged heart chambers cause fluid to leak out of the blood vessels into the lungs (called pulmonary edema or ‘water on the lungs’) and sometimes the belly (ascites). The development of clinical signs is referred to as the ‘symptomatic’ stage of CVD (Stage C). The build-up of fluid in the symptomatic stage is called congestive heart failure. In addition, sometimes in the symptomatic stage of CVD the heart cannot send enough blood forward to the body and this can cause dogs to become weak or tired, or even faint. What are the clinical signs that my dog may have symptomatic CVD and needs to be examined by my veterinarian? The clinical signs that may occur in dogs with CVD can also occur with other diseases. If you know your dog has CVD you should always watch for these signs to develop, and if they do, you should contact your veterinarian. It is important to note that not every dog will develop all of the following clinical signs and many dogs will have more than one. How can my veterinarian determine if my dog has CVD? The best screening test to detect CVD in your dog is listening with a stethoscope by your veterinarian (auscultation) once per year. Other tests will be recommended if your veterinarian hears a heart murmur. If you wish to have your dog ‘cleared’ for breeding purposes your veterinarian may refer you to a veterinary cardiologist. What tests might be recommended by my veterinarian once my dogs has CVD? If your dog is asymptomatic (no clinical signs of CVD are present, as outlined above) and your veterinarian detects a heart murmur, further tests will be recommended to help determine how big the heart is and if your dog should start taking any heart medications. Some tests are done to determine if there are any other problems that could be detrimental for dogs with have CVD, such as high blood pressure or kidney disease. Dogs with a heart murmur and one or more of the clinical signs listed above could have heart failure, which requires medications. Your veterinarian will recommend tests to help determine the cause of the clinical signs and help them select the appropriate medications. Referral to a veterinary cardiologist may be suggested in some cases. How is CVD treated in dogs? Medication is not required if the recommended tests determine that the heart is not enlarged and the blood pressure is normal. If the tests detect heart enlargement, and/or high blood pressure, medication(s) may be prescribed. Can I slow down or reverse the progression of CVD in my dog? Several studies have looked at preventing CVD from progressing to the development of congestive heart failure. Unfortunately, no drugs that have been tested thus far have been proven to be effective in either preventing or slowing down the progression of CVD. As new drugs are developed they will undergo testing, so there may be drugs in the future that could help with CVD progression. If your dog has symptomatic CVD (heart failure), medications will be prescribed. These medications will be continued forever, although the doses and frequency of administration may change over time. Sometimes additional medications are required, while others are sometimes stopped. In addition, your dog may need to stay in the hospital for a few days while adjusting to the medications. Additional medications are frequently prescribed for individual dogs. Note: some medications and herbal supplements can have adverse interactions with heart medications, so it is important that you not use any medications (new or previously prescribed) without talking to the veterinarian that prescribes your dog’s heart medications. Are there any side effects of any of these medications? Urinating larger amounts more frequently: dogs always need to urinate within 1-2 hours after receiving furosemide. To prevent accidents in the house, use a ‘doggy door’ or be sure to not give the furosemide pills within 2 hours of bedtime or leaving the house for an extended period of time. Reduced appetite or not eating normal amounts of food: if this happens to your dog, talk to your veterinarian as it is important that your dog does not lose weight. What kind of follow-up will my dog need now that he has CVD? If your dog has asymptomatic CVD (Stage B1 and B2), your veterinarian will recommend recheck appointments every 3-12 months depending on how advanced the disease is. If and when a medication is started you may need to return in 10-14 days to have your dog’s kidney and liver values tested, and blood pressure taken. If you notice any of the clinical signs listed above at any time, you should not wait for the next recheck appointment, but call and make an urgent/emergency appointment. If the clinical signs are severe and/or develop suddenly (your dog cannot breathe, rest comfortably or sleep) you may need to take him to the nearest emergency facility as soon as possible. One of the best ways to help your veterinarian determine when to start or adjust your dog’s heart medication(s) is to observe and record the home resting/sleeping breathing rate of your dog (see below). If your dog has symptomatic CVD Stage C (heart failure), your veterinarian will recommend a recheck appointment every 2-4 months. In addition, if and when a new medication is started you may need to return in 10-14 days to have your dog’s kidney and liver values tested, and your dog’s blood pressure taken. If you notice any of the clinical signs listed above at any time, you should not wait for the next recheck appointment, but call and make an urgent/emergency appointment. If the clinical signs are severe, and/or develop suddenly (your dog cannot breathe, rest comfortably or sleep), you may need to take him to the nearest emergency facility as soon as possible. One of the best ways to help your veterinarian determine when to start or adjust your dog’s heart medication(s) is to observe and record the home resting/sleeping breathing rate of your dog (see below). Why should I evaluate my dogs resting/sleeping breathing rate at home? Increases in your dog’s breathing rate while resting quietly or sleeping is a very important clinical sign that your dog may be developing heart failure and needs to see your veterinarian. This is an early clue that heart failure is developing, and your observations can help limit how sick your dog becomes, reduce the chances that your dog will ever have to stay overnight in the hospital, and help reduce the costs associated with heart failure treatment. What is a normal resting/sleeping breathing rate in a dog? In general, all normal dogs, and dogs with asymptomatic heart disease and heart failure that are well controlled on medications, have a breathing rate between 15-30 breaths every minute when they are resting calmly or sleeping. Lower rates are even possible and are no cause for concern providing your pet is otherwise acting normally. It is considered normal for breathing rates to be much higher than this when dogs are hot, stressed or active. Resting/sleeping breathing rates that are consistently greater than 30 per minute are increased and considered abnormal. In some cases, even rates lower than 30 per minute may be considered increased and abnormal by your veterinarian. You should ask your veterinarian what rate is considered increased and abnormal for your dog. The first thing to do is to count the breathing rate a few times over the next couple of hours to ensure it is a consistent finding. If the breathing rate is consistently increased then you need to contact your veterinarian as soon as possible. Typically your veterinarian will recommend a recheck appointment in the next day or two so medications can be adjusted. If the resting/sleeping breathing rate is increased and other ‘clinical signs’ as outlined below are observed, then the situation may represent an emergency. In this case, especially if it is after hours, you may need to go to a veterinary emergency center. What are the clinical signs that may be associated with heart disease or heart failure in dogs? How do I count the resting/sleeping breathing rate in my dog? It is preferable to wait until your dog is sleeping quietly, but your dog may be resting calmly and quietly. The sleeping breathing rate is typically a little lower than the resting breathing rate. Watch your pet’s chest; it moves in and out as they breathe. One breath is counted when the chest has moved in and out once. Use your watch or phone to time 30 seconds and count how many times your pet breathes during the 30 second period. Next, multiply the number of breaths that you counted by 2 to get the number of breaths in 60 seconds or 1 minute. Alternatively, you can count the total number of breaths that occur in 60 seconds (1 minute), and then there is no need to multiply. Keep a record, such as in a diary or on a calendar, of the breathing rates you count. There are some free smartphone applications that can help you keep track of your pet’s home breathing rate. Search ‘your dog’s heart resting respiration rate’. How often should I count the resting/sleeping breathing rate in my dog? Typically, your veterinarian will have you count the breathing rate once per day for a week while you are learning so that you become comfortable performing this exercise. This way you and your veterinarian can also learn what your pet’s normal resting/sleeping breathing rate is. Yes, there are now sensors that can help you keep track of resting respiratory rates (and resting heart rates) at home. Remote health monitoring is becoming much more common in human and veterinary medicine, and there are sophisticated (but non-invasive) devices that accomplish this. Ask your veterinarian about it. It is always recommended that you also do your own manual counts. How often do I need to check my pet’s breathing rate if he doesn’t have any clinical signs of heart disease? Home breathing rates do not need to be evaluated in all pets with asymptomatic CDV. Your veterinarian will tell you if and when it is time to start monitoring the home breathing rate in your pet. In general, it is most important to start in pets with advanced asymptomatic heart disease that have a high risk of developing heart failure within the next year. In this case, breathing rates are typically recorded once or twice per week, although your veterinarian may ask you to monitor it more frequently or even once per day. How often do I need to check my pet’s breathing rate if he has heart failure? Home breathing rate should be evaluated at least once per day in all pets that have heart failure and are now receiving medications, such as furosemide. Can special diets help dogs with CVD live longer? Some pet food manufacturers have developed heart-specific diets. Some of these diets are severely restricted in salt and some are moderately restricted in salt. The diets that are severely restricted in salt should never be used in asymptomatic dogs with CVD. They may be used in dogs with heart failure as long as the dog will eat them. The heart-specific diets that are moderately restricted in salt (or any diet that is moderately restricted in salt, such as most senior diets) can be used in asymptomatic dogs with CVD. While these diets are unlikely to be harmful if used as outlined above, they have not been shown to have any benefit, so it is unlikely that your veterinarian will recommend that you change your dog’s diet if he is otherwise healthy. It is often beneficial to limit treats that are high in sodium for dogs that have heart disease, especially those in heart failure. Are there any dietary supplements that may help dogs with CVD live longer? Supplements are unlikely to be harmful if used as outlined by a veterinarian who is familiar with all the medication your dog is receiving and the type and severity of heart disease your dog is suffering from. In most cases, there is no proof that your dog needs to take any supplements if he is on a high quality commercial dog food diet. The most common supplement recommended in dogs with CVD is omega 3 fatty acids. You should discuss any supplements your dog receives, or any new ones you wish to start, with your veterinarian. What about exercise for my dog with CVD? In general, dogs with both asymptomatic and symptomatic CVD should be allowed to exercise at their normal level if they want to, but the duration of sustained strenuous activities such as ball retrieval, swimming, Frisbee etc. should be limited especially in really hot or cold weather. Some exercise is good for you and your dog and part of what helps your dog enjoy their life. Is there a surgical treatment option for dogs with CVD? In human medicine, it is common for patients with significant CVD to have the leaky valve(s) repaired or replaced by a surgeon. This requires open-heart surgery and cardiopulmonary bypass, and dogs, especially small dogs, are very hard to perform a cardiopulmonary bypass on, so open-heart surgery and valve replacement or repair is not readily available for dogs. A few veterinary surgeons have performed these surgeries on a very limited number of dogs. There is a very high risk of death and the surgery is very expensive so this option is not recommended at this time. If you wish to investigate the possibility of surgical repair or replacement, you should discuss this with your veterinarian. In the future, catheter-based (minimally invasive) techniques may become available and allow repair or replacement to be done safely without the need for cardiopulmonary bypass. Heart transplantation is not an option in dogs. How long will my dog live now that he has CVD? On average, the majority of dogs with asymptomatic CVD will live for many years (1-5 years or longer) without ever developing any clinical signs of heart failure. Some will develop clinical signs of heart failure as outlined above and it can be difficult to determine how an individual dog’s condition will progress, so this is why your veterinarian recommends tests and recheck appointments. Once your dog develops clinical signs of CVD, medications can typically eliminate or reduce the severity of the clinical signs, but the disease will still progress and eventually the medications will not work as well. Sometimes, new medications can be added or the doses of your dog’s current medications adjusted but eventually this will be insufficient in maintaining your dog’s quality of life. Your veterinarian will help you recognize when and if this is the case for your dog. In general, with the appropriate medications and recheck appointments, many dogs with heart failure due to CVD live for 1-2 years or even longer.